On my previous packrafting trip into the Minam River two weeks earlier I had tried to talk Jerry into hiking in from the Bearwallow trailhead up to Standley and then down into the canyon a few miles upstream from Red’s Horse Ranch. Starting from the Bearwallow trailhead is certainly longer and harder than the Moss Springs trail, but it also gets a lot less use and looked like a more interesting hike than going from Moss Springs. Jerry was not swayed, wanting to stick with the shorter easier hike for the packraft’s first true initiation. Since I couldn’t convince Jerry to try it with me, I decided to do it on my own. The water was beginning to get a little low for floating purposes and I wanted to see how well the packrafts performed in low water and what the real minimum floating flow was for the Minam River. Friday afternoon I set off from the store at Minam with my Baylee River Runner packraft strapped to my pack and the river running at 220 cfs at the gauge. 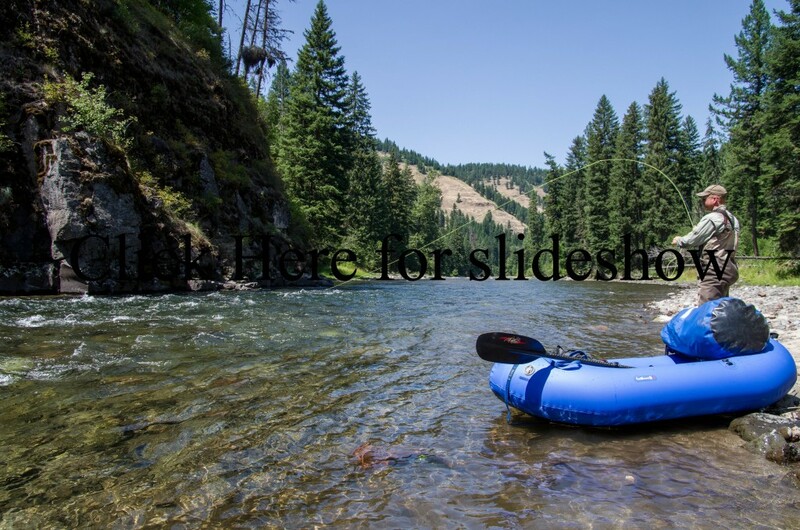 The book “Oregon River Tours” had a recommended minimum flow of 800 cfs, but the author ran the river in a raft. The book “Paddling Oregon” has a recommended minimum flow of 500 cfs for kayaks and the like, I was headed down at half the minimum recommended flow and hoping that I wouldn’t tear up my packraft and end up packing the packraft out after I went to the work of packing it in. To get to the Bearwallow trailhead you head upstream from the town of Minam a couple miles to Big Canyon road and begin winding your way up Deer Creek. The road is a good gravel road until it splits and you can either go right towards the Cougar Ridge trailhead or left towards the Bearwallow trailhead. From this split the road gets narrower and the rocks bigger. It is not a bad road the rest of the way, but the exposed baserock will pop poor tires easily. As the road winds higher it works its way over to the east until you are viewing the Bear Creek drainage. There was a bad fire up there a few years back and there are large sections where there isn’t a single tree living. I saw few road signs after the road split and I stopped and looked at my Eagle Cap Ranger District map often to make sure I was on the correct dirt or gravel road according to the topography. Eventually I wound my way around near the top of the ridge and I saw a sign for road 153. Looking at my map, the trailhead was supposed to be before this road so I turned onto it and drove only a short distance before seeing the permit dropbox for the trailhead. Apparently I was at the trailhead. My first trip with the new Feathercraft built Baylee River Runner packrafts down the Moss Springs trail seemed much too easy. My pack didn’t even feel heavy although I was carrying an inflatable boat, paddle, rescue bag, life jacket, patch kit, extra cam straps, large dry bag, pump, and helmet along with my usual fly fishing and camping gear. I did go light on my camera gear that weekend and did not carry my tripod or a heavy telephoto lens. I didn’t even take a zoom lens at all that weekend, I simply took two very small pancake prime lenses and a few extra batteries. I use a Pentax DSLR and the unique pancake lenses that Pentax makes are a backpacker’s friend as they are light, compact, and excellent quality. Now by myself starting a harder and longer hike I somehow decided to pack more gear. I decided to add my tripod and tank like telephoto lens just in case I saw some wildlife far away. I also splurged on my flyboxes. I will often carry one or two flyboxes when I am doing a lot of hiking, but I haven’t had any free time this spring to sift through my different boxes and recreate my “essentials only” hiking fly box and instead threw four fly boxes into the top of my pack. No problem I thought. The last packrafting trip was way too easy anyway. I threw my pack on my back. It was heavy and I thought for a second whether I really needed my tripod or big, heavy 300mm lens. I had not weighed my pack before leaving this time. I had weighed my pack with full camera gear the weekend before when I took my kids on a three day Eagle Cap Wilderness hike up to John Henry Lake and the North Minam Meadows and it weighed 43 pounds. 43 pounds felt light enough for covering 6+ miles a day with 2,600 feet in elevation gain. Today, my pack felt heavy and I pondered for a minute or two how useful my tripod and 300mm lens would be. Those two alone are 7 pounds. I find a lot of uses for my tripod though whether it is long exposures of the river to make it look like silk running over the course basalt and granite, or using it to take a picture every 3 seconds to make a time-lapse video, or simply using it with a remote control to try and get really sharp pictures; I like trying to become a better photographer and therefore like having the tripod. The 300mm lens on the other hand often doesn’t even get used. The longest lens I owned was 200mm until I bought this 30 year old tank of a lens off ebay a few weeks back. Chances are, I would not need it but if I didn’t pack it I would probably run into a mountain goat, bighorn sheep, cougar or bear and be mad at myself for not having a lens long enough to get a decent picture. Down the trail I went, tripod and long lens in my pack. After all, it was only a 1,200 foot elevation gain over the first 5 miles and the other five miles was downhill; should be easy. The fire that had killed off most of the trees on the drive had continued its way up the ridge I was now walking. 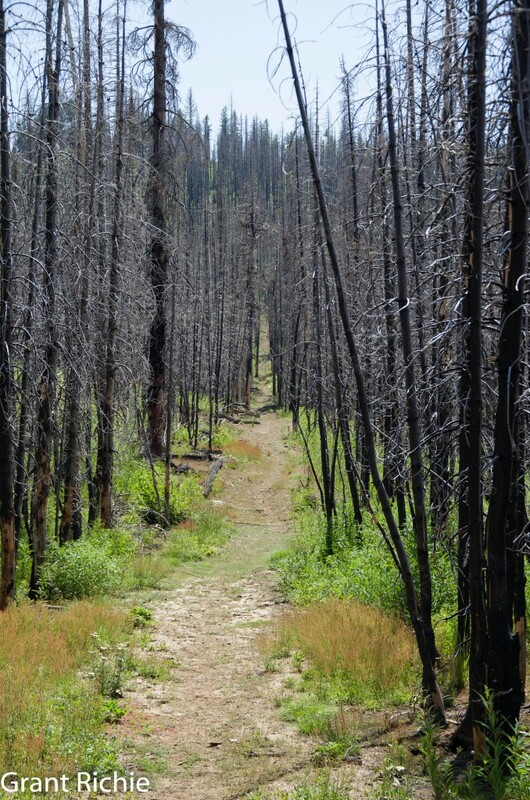 It was a forest of charred remains with a trail meandering its way along the nose of the ridge. Plant life on the ground looked a little sparse as well and I now had no question in my mind why Bear Creek runs dirty when we get a big thunderstorm with a heavy rain. My pack did not feel terrible after I got going. It didn’t feel great either, but it was manageable. To my chagrin I found two Bud Light cans on the trail to Standley. I guess Bud Light cans need a warning also. A better find was a new plant. I have been doing my best to learn a new plant or two each backpacking trip I make somewhere. Usually it is whatever plant catches my eye a lot and peaks my interest. 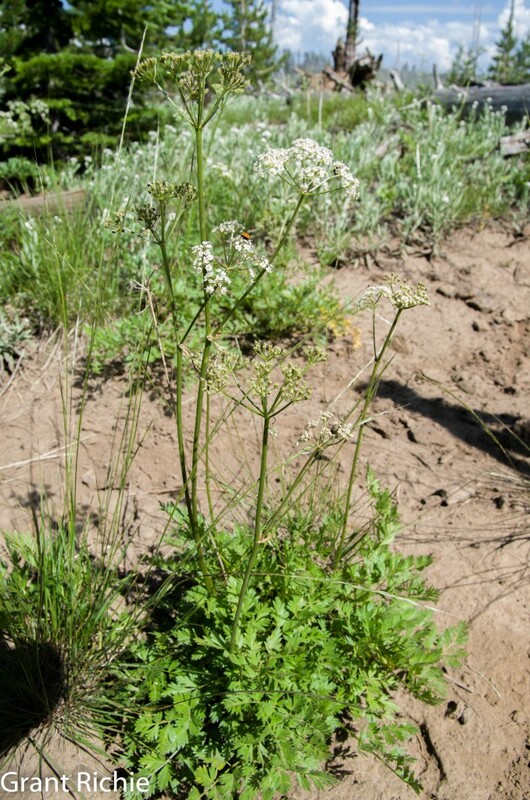 Today, I thought I was seeing a new species of Lomatium or biscuit root (parsley family that was an important food source for the Nez Perce). I took several pictures and now home, I find my guess was close but not quite there. The plant I was noticing a lot was indeed in the parsley family, but was not a Lomatium. This particular plant was Ligusticum grayi or Gray’s licorice root or Gray’s Lovage. I think I prefer Gray’s licorice root as saying Gray’s Lovage sounds a bit odd to me. Now you may be wondering why I am going on about these plants, but the Lomatium’s were some of the most important food sources for Native Americans in eastern Oregon. The roots of Lamatium grayi and Lomatium couse could both be eaten raw, baked, boiled, or dried and pounded into biscuits to provide a food supply that would last up to three years. Any food that can last 3 years in storage would have to be an important food source and as I have walked and floated the canyons of eastern Oregon this spring and summer I have noticed that the different species of Lomatium are everywhere. Next time you are driving by somewhere called Couse Creek in the spring (and there are lots of creeks called Couse Creek) look for a small green plant with yellow flowers. I see Lomatium Grayi more often (which is taller and has a more parsley like leaf than couse) and I have dug the root a few times just for a taste test. It isn’t too bad. A bit chewy and carrot-like, but different. Sweeter and just different, but very edible. One last reason the Lomatium species are significant when talking about the Minam. The name Minam itself is an Anglicization of the Nez Perce word Eminamah. Eminamah seems to have been the name for one or more of the Lomatium plants that grows here. 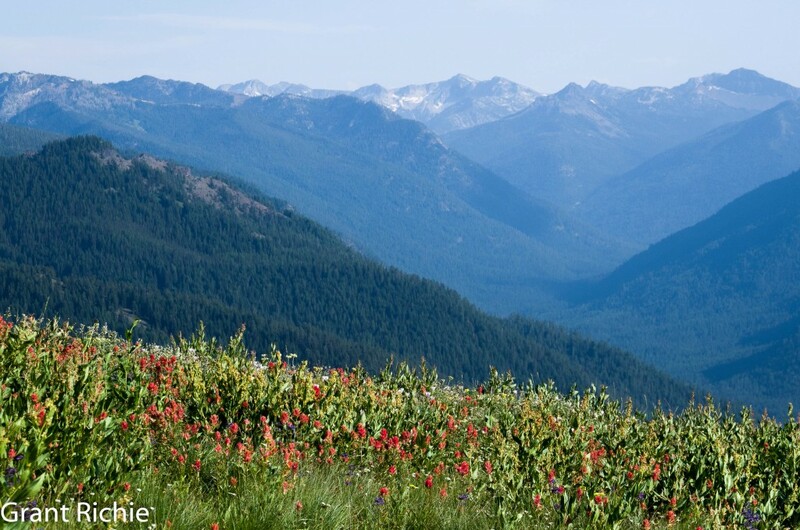 The Nez Perce simply referred to this place we call the Minam as Eminamah for the abundant Lomatium plants that grew in the rocky soil. Back to this Ligusticum grayi or Gray’s licorice root—this plant’s root was also important. The roots were used as a pain killer for stomach aches and coughs. The leaves were also used for food by soaking them in water and then cooking them. But enough of plants before I bore you. The hike up from Bearwallow trailhead is certainly a much more interesting hike than the Moss Springs trail. 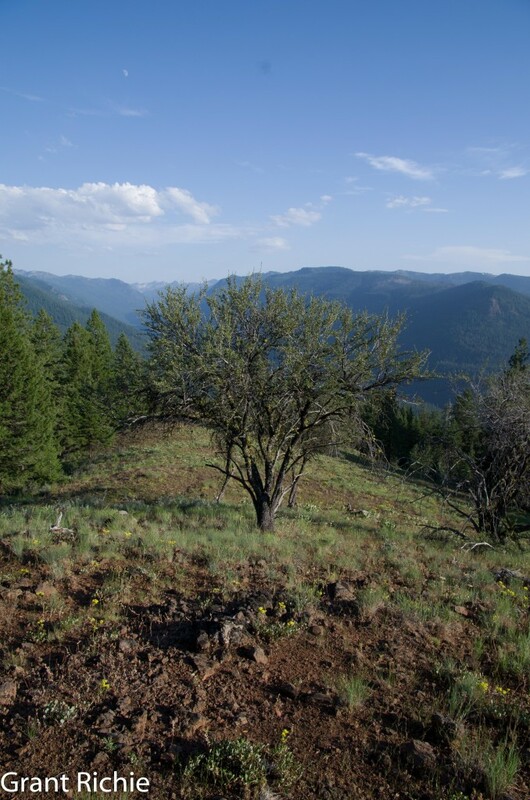 After winding my way through skeletons of dead and decaying trees, a short walk to the left of the trail leads to some great views of the Bear Creek drainage. Up a little farther at Standley there is a sturdy looking old cabin that was once used as a ranger station. At Standley there are many springs coming out of the ground and several of these springs feed one of the most important creeks on the lower Minam. Trout Creek gets its cold water from these springs and 24 hours after I drank water from the spring at Standley, I again was drinking water at the mouth of Trout Creek on the lower Minam and its water was still cold and pure. Small cold water tributaries are important for trout when summer time heat warms up the water in the lower stretches of our rivers. After a short rest at Standley, eating a late lunch washed down with cold springwater, I headed down the trail. Standley is the highest elevation point in this hike and the trail began losing elevation soon after leaving the cabin. Now I was getting great views of the Minam River Canyon; a mixture of basalt ridges with bunch grass hills and snowy granite peaks up the canyon further with a dense blanket of forests below. Unfortunately the sky was getting hazier as the day went on which didn’t make for the best picture taking. As I stood scanning the forest, a white speck floating above the trees caught my eye. It was an airplane, but it looked tiny in the expanse of the canyon. I zig-zagged my way 5 miles down the canyon trail. One interesting thing I found on the trail was a smallish tree that looked kind of scrubby, almost bush like, but it was too big to be a bush. After scouring my plant books and verifying with a biologist, I have identified it as Cercoparpus ledifolius or mountain mahogany which is a bit of a rare species from what I understand. Nearing the canyon floor, the fir gave way to big, old Ponderosa’s. Once to the main river trail I quickly found a path that led to the river. I was thirsty and ready for some cold water. A faint trail led me to a great campsite just downstream of Chaparral Creek. It was evening now and I was ready to get my pack off, pitch my tepee tent and make some dinner. After dinner I scouted up and downstream a quarter mile to see what the river had in store for me in the morning. I then crawled into my sleeping bag and read a bit before falling asleep. I slept in the next morning. I find that getting out into the woods is often the best way to catch up on needed sleep and my first night on a multi-day trip by myself, it is not unusual for me to sleep 10 hours the first night. Feeling well rested I quickly boiled water for my coffee and oatmeal and began breaking down my camp. I began fishing upstream through some great riffles, runs, and small pools. I had tied on a Hedge Hog dry fly which has been slowly becoming one of my favorite dry flies. I often fish a stimulator in mountain streams, but the hedgehog floats better and is buoyant enough to suspend some fairly heavy nymphs If you want. This morning, I tied on a small Copper John. I spent several hours catching fish up and downstream of camp. The rainbows never got over 10”, but they were pretty willing. As the morning was about gone, I finally decided I really had better get in my packraft and begin my float. My goal was to make it to Trout Creek for my second night’s camp. I had broke my flies off in a bush near camp and decided I would put my fly rod and camera in my dry bag for the first couple miles of the float as I had not floated above Red’s Horse Ranch before. The river started off meandering through some riffle and runs, but quickly gained speed and starting losing elevation. I was into a pretty good boulder garden which had paths barely big enough for my packraft to fit through. This section above Red’s gave me a bit of an adrenaline high for sure. It was a bit harder than anything I have ever floated solo and any stupidity on my part could get me into real trouble here. One thing about doing things like this by yourself is that you are hyper sensitive and aware. When floating in a group, people often become complacent and do stupid things on easy sections of water that get them into trouble. This section of water was challenging and I knew if I screwed up there would not be anyone there to save me. I paddled hard and safely navigated through big boulders with narrow paths until the river dumped into the “Salmon hole” just below Wallowa Creek. Floating through the calm clear pool I saw numerous Chinook go swimming upstream around me. I guess they got it right when they nicknamed this piece of water. I floated a little farther downstream, making sure the hardest stretch was over with before I got my fly rod and camera back out. I worked my way downstream stopping above the best looking runs and pools, working my big dry fly and dropper through the good water. Rainbows in the 6”-10” range continued to oblige me. Nearing Red’s I decided I was ready to look a little deeper and tied on a streamer and stonefly nymph. I needed to begin covering ground so I could get far enough downstream by the end of the day and I told myself that I was only going to stop at the best looking spots. But there were too many. It is hard to pass up good water and there is a lot of good water upstream of Red’s Horse Ranch for miles and good water for roughly two miles downstream of Red’s. This section of the river may hold some of the best water of the canyon. There is no shortage of good riffles and runs with quite a few deep pools thrown in as well. After I switched to my streamer and nymph setup I stopped at a large pool downstream of the salmon hole. About four years ago on my first trip into the Minam, I dubbed this hole the whitefish hole because I caught whitefish after whitefish after whitefish. What was more amazing was when a bit of sunlight reflected off the bottom of the pool which revealed an almost solid mass of shimmering golden backs. I had never seen so many whitefish before. Today, I could not see down into the depths but I caught two whitefish and two rainbows closer to the 12” range before getting into my Baylee River Runner packraft and heading downstream. Near Red’s I beached my packraft upstream of a log across the river. I then grabbed my fly rod and paddle and took them over to the other side of the log, also setting my camera on the ground so I didn’t bang it while carrying the packraft over the fallen tree. I portaged my packraft and began my float again. I rarely stop and fish at Red’s simply because this is one of the only places I tend to see people. I floated on by until I came to a second tree across the river. I got out and took my fly rod and paddle once again across the fallen tree and went to set my camera down. I panicked, my camera was not there. I had left it upstream at the last fallen log. You may think that my worst nightmare would be getting eaten by a bear, or drowning in the river by myself with no one around to help, but my worst nightmare is forgetting my expensive camera somewhere along the river and not knowing where. My worst nightmare almost came true. Although I forgot my camera on the river bank, I at least knew where I had left it. I pulled off my lifejacket, secured my boat, and hustled upstream. Luckily it wasn’t very far and I had my camera back after a brisk 20 minute walk. After that I only set my camera beside the river if it was on my lifejacket. As I floated downstream I had to begin passing up goodwater in favor of making up time. I was happy to see several large pods of bull trout as I passed over some holes. Although I see large pods of bull trout in the Wenaha and some other rivers, I had not seen any yet on the Minam and wondered if there was a good population here. There should be. The habitat in over half the river is great and they have free range to migrate to bigger water in the winter to forage. I have searched for bull trout studies on the Minam many times but haven’t found any. It seems the Minam River has not been studied extensively like many of our other rivers. I need to find some college aged fishery biologist who needs to do a masters or PhD thesis on bull trout and convince that person to study the Minam. I, of course, would be happy to volunteer help in the logistical needs of such a study. Actually a telemetry study could be done easily with the existing fish traps near the mouth and pilots that already fly the canyon regularly. As I mentioned earlier, the best fishing water ends downstream a couple miles below Red’s Horse Ranch. The river then becomes continuous Class II and III whitewater for close to ten miles. It might be closer to 8 miles, but it is a significant portion of the lower river. I have fished it, but it is nearly all pocket water. I had high hopes for this section the first time I fished it, but it seemed to be full of very small fish, most of them less than six inches. I fished it in late summer, so it may be better at other times of year. But again it is almost all pocket water and shallow riffles for miles. The river gets better for fishing near the creeks that enter from the east, Murphy, Trout, and Cougar Creeks. I have hooked into, but failed to land several rainbows in the 16” plus range in this section and the water simply looks better for fishing. You have variation again: runs, riffles, pools, and pocket water rather than only pocket water. There is a long riffle section again at Meads Flat, but there is a good couple miles of water just below Meads Flat again. After that the river is often too wide and too shallow in my opinion. The lower 25 miles of the river is actually often wider than seems natural. I thought that in the past before learning any of its history and wondered if it was naturally that way or caused by human use somehow. Now I know. The lower 20 miles of river had millions of board feet of timber floated through it. Before they began floating logs they went through at low water with dynamite and tried to blow out rock outcrops and any other structure that would catch logs floating down the river. Then for quite a few years a big splash dam right above the Minam Falls was opened daily to send a flash flood down the river and move the logs a little further downstream. This was the best way to get logs downriver at the time, but it changed the river for the worse. It would be nice to see a stream restoration project done on the lower river that is not in the Wilderness area, it could really use it and would go a long ways towards improving salmon, bull trout, and steelhead habitat in this system. Restoration in the lower end of the wilderness area would be harder, but improvements could be made with some willing man power. Back to the trip, I eventually had to put my fly rod away and just paddle to make time. The river downstream of Red’s became increasingly wide for the amount of water and increasingly difficult to find paths wide enough and deep enough to float. I came upon many rock bars that I looked at and thought there was no way I would be able to find a path through them, but time and time again the Baylee River Runner packraft slid through the narrowest and shallowest paths. I was quite impressed. I think my Aire IK’s would have been getting stuck more often. Don’t get me wrong, there were certainly sections of river that I thoroughly tested the abrasion resistance of the lightweight material the Baylee packraft is made out of. I will not float the Minam this low again (220 cfs). I made it to Trout Creek, my shoulders a bit sore from the hard maneuvering through shallow rock and boulder gardens. The sun was now off the canyon and I had about an hour of daylight left to make camp. I was also a little cold, a rodent of sorts had chewed three large holes in my expensive waders this spring and I had not fixed them yet. I kept forgetting that they needed repaired until I was ready to use them and this trip was no different. Hoping for a temporary fix, I applied packing tape to the inside and outside of my waders at the hole. I probably should have used duct tape though as the packing tape only lasted part of the day. While I was paddling, I was sitting in a nice puddle of water. When I stood up the nice puddle of water ran down my legs to my feet so that by the time I stopped to make camp when it was nearly dark, I was wet, cold, and tired. I personally like being tired from a trip like this. It makes me feel good somehow. I know it might be strange, but after you wear yourself out, you can make a nice warm fire to dry, enjoy some beef stroganoff, and relax to the sound of the river and canyon—satisfaction. I was up early the next morning and had breakfast, coffee, and camp broke by 7 a.m. There was good water all around my camp and I didn’t want to waste time sleeping this morning. I had also rose and hooked a very large trout under a rock over hang about a quarter mile below camp at the beginning of July and I really wanted to see if he was still there and willing to come to the surface and do a torpedo impersonation with my dry fly as the target. I first assaulted the hole from river left starting my drag free drifts in the shallow water near the hole. I progressively worked my fly closer to the prime water until I was working the best water right next to the overhanging rock. I received a couple of small fish rises, but no big guys. I waded down and across river and began working my dry fly from this angle, again working all the drifts over thoroughly, but nothing came. I then decided to wade back across stream, up the river, and back across again to work my fly down under the rock overhang and swim and dance my fly upstream. I worked my fly hard, but the fish ignored it. It was too good of a spot to simply pass without catching something good. I cut off my dry fly and tied on a double bunny and a stonefly below it. I began floating this setup through and stripping it back up the sides of the hole. I also began feeling heavy hits on the end of my line. The fish were there, but they didn’t feel like running up to the surface today. The oddest fish I caught out of this spot was a fin clipped rainbow who took my double bunny. The fish had been released in the Wallowa either at the hatchery in Enterprise or at the acclimation ponds at Big Canyon just upstream from Minam. The fish had taken a wrong turn to get to the ocean though and was now ten miles up the Minam River. My float down the river the rest of the day was a workout. The river was shallow and wide much too often and there were a number of spots where I had to get out of my Baylee River Runner packraft and walk it to some deeper water. It performed amazingly well though. I have personally decided that 220 cfs is below the minimum floatable flow. 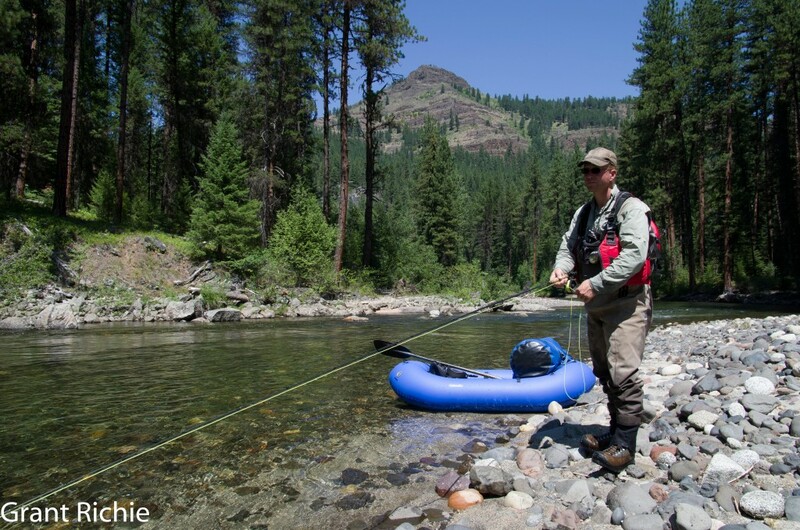 300 cfs might float a packraft all the way through and provide good fishing opportunity. I guess next year I will plan a trip at 300 cfs to see if the river is floatable at that level. Click the picture below to see more pictures from this trip.